Plus Size Kitten: Make Your Own Havaianas! Check out my designs! Please give me comments on my creations! Very sad, I didn't take much pics of the media pre-launch event today coz I went crazy making my own pairs from morning until afternoon. Each pair has a different meaning and feel, and I wanted it all to be special. Especially my first pair, I pimped it like nobody's business! haha. Check out my bridal pair which is using a butterfly diamond pin and 3 Swarovski crystals. I though I'll show my experience today and how I made my pair from the photos below. Hope you enjoy my post :) and don't miss this 2 day event to make your own too! It's too fun! Ask me anything! You can also click here to see official pics of the Singapore & Philippines MYOH event, where I compiled into a easy 1, 2 & 3 guide to making your own flip flops. 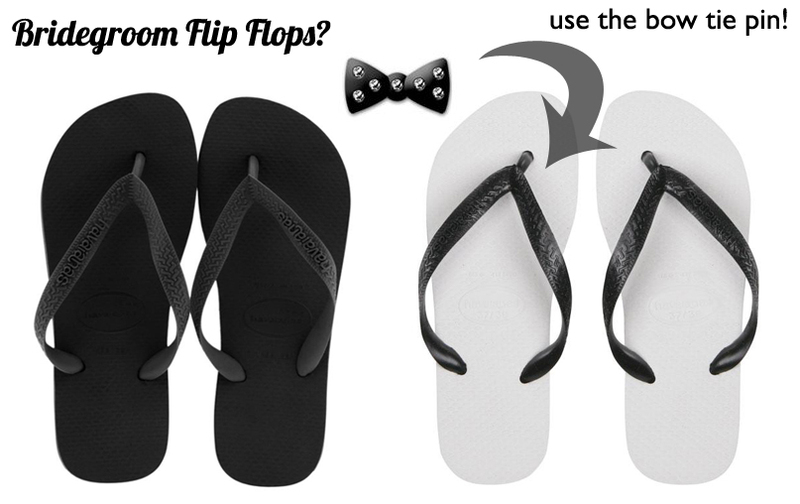 bridgegroom flip flops: play with black, grey, white! customize flip flops for party or bridesmaid? P.S: The pins are a fantabulous way to make your flip flop special. Do take some time to choose. There's so many pins you might get confused. Also note that only for this 2 days the pins are RM3.50 each. Normally they cost RM19.90. Pins: RM3.50 each (normal days RM19.90). 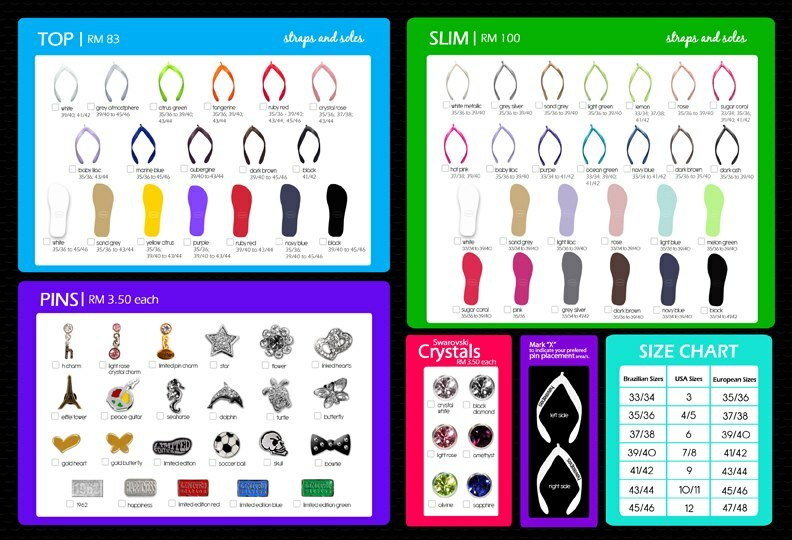 *sizes and colors based on style & stocks. Get a copy of Female/Hello Sept Issue and there's a cut out coupon for buy one pair, 2nd pair 50% off! 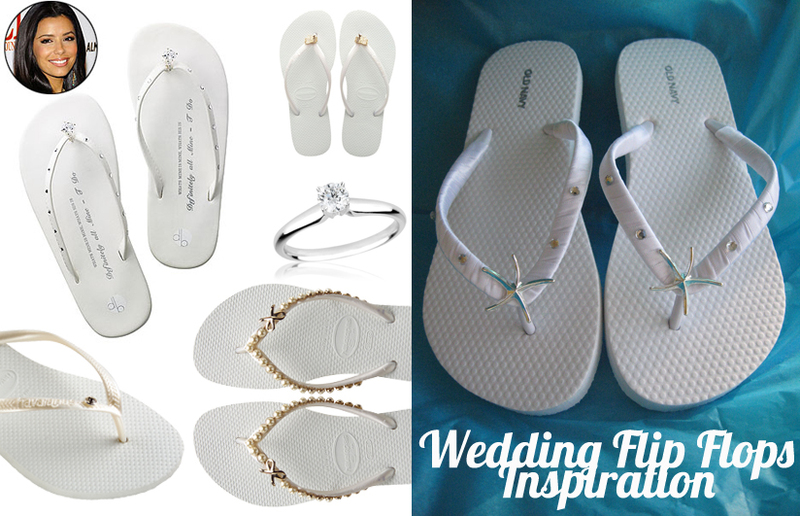 the bridal flip flops is a brilliant idea!! shucks! should make.... bridesmaid flip flops too!!!!!!!!!!!!!!! for my future bridesmaid! there's still time! just get the sizes and get them done via.... lol!! thanks Vina! u gona make one? Bridalina is very pretty and a super cool idea for beach wedding :) how about the bridegroom ;)? thank you Sri ^___^ I wanted to make the bridgegroom one but.. =_= my fiance being so "lelaki" won't want to wear flip flops. Black flip flops with white straps and put the bling bling black bow tie. like!! i think i will go crazy with this too.. the price will go wild to if I am gonna do this. yeah! had fun :)) would like more of this kinda activity in shopping malls! TRUE DATTT... i also T_T can't bear to wear them yet!!! especially the white one.. i was seriously thinking to wear it out.. wedding or not!!! arghh... open ceremony has to delay for me!!! Thank u yumiko I feel so happy to read your comments about my designs! I would help give tips to u if u were there!